If you’ve ever had the flu, you know you don’t want it again. And the best way to prevent it? An annual flu shot. Let’s take a look at some common questions about the flu vaccine. Q: Why should I be vaccinated? Cases of the flu range in severity, but the flu can be deadly for the elderly and those with compromised immune systems. Beyond the basic flu symptoms, flu may also lead to ear and sinus infections, dehydration, and even bacterial pneumonia. An annual flu vaccine is the easiest way to prevent the flu. A: The Centers for Disease Control and Prevention (CDC) recommends that everyone 6 months of age and older be vaccinated against the flu annually. There are very few exceptions to this recommendation. Babies younger than 6 months and people with life-threatening allergies to the flu vaccine or its ingredients should not be vaccinated. Those who are allergic to eggs or who have Guillain-Barre Syndrome should talk with their doctor before being vaccinated. The CDC especially recommends flu vaccination for these groups. Q: When should you be vaccinated? A: The flu season begins in October and can last through May, and cases of the flu typically peak around January or February. 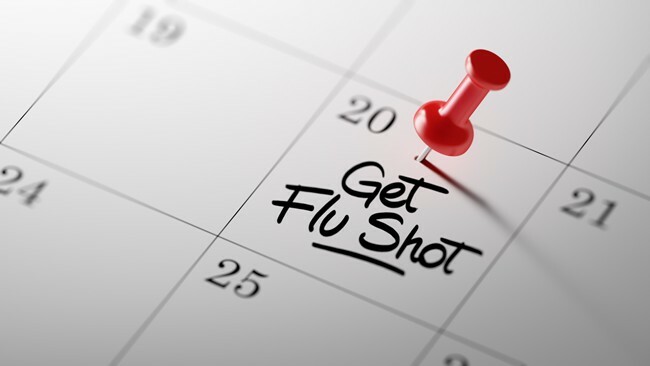 Once a person is vaccinated against the flu, antibodies form within two weeks. These help protect the body against the strains of the flu that are in the vaccine. You can be vaccinated at any time once vaccine supplies are available, but you may wish to wait until October to do so. This will help ensure your protection against the flu lasts through the entire flu season. A: Unlike in past years, the CDC does not recommend you receive the nasal spray form of the flu vaccine, commonly known as FluMist. In a study of the effectiveness of last year’s flu vaccine, the nasal spray vaccine was found to be only 3 percent effective in preventing the flu. Standard-dose trivalent shots, which are the most common. These protect against three strains of the flu. High-dose trivalent shots, which are recommended for people older than 65. Quadrivalent shots, which protect against four strains of the flu. Talk with your doctor or pharmacist about what type of flu vaccine is right for you.